You don’t want to miss this! Click here to RSVP today! realized it wouldn’t go away I cried myself to sleep. about my epilepsy and would make fun of me. removed to try and stop my seizures, so I was out of school my sophomore year. how to stand up for myself. VNS (Vagus Nerve Stimulator) implanted. there was nothing left to do; pills didn’t work and there was no surgery left. but two years later I got pregnant again and had a daughter in May 2014.
made me who I am today. helps someone out there in some way! similar bills across the nation. defined as cannabis with THC content below .3%. “no medical use” is no longer valid; therefore, cannabis should be rescheduled. specialists and research institutions. This needs to change. 2014 can be found at https://www.govtrack.us/congress/bills/113/hr5226/text. exhibits, educational conferences, summer camp and more. a “high”, but it can save the lives of children. My name is Jenny and I am turning 4 this month! I love to dance and play school with my Aunt. My mom noticed that I would stare off into space and would fall down for no reason. She made an appointment with my pediatrician. My doctor thought it sounded like I was having seizures so he referred me to a neurologist. The neurologist ordered an EEG nothing wrong. He decided we needed to have an MRI of my brain. We found a sore on my brain that I have had since I was born. I started taking Keppra and my seizures went away for 7 months. We increased my medicine and I have been fine the past 5 months. I have become very hyper and keep my parents and grandparents very busy! My doctor is very proud of how well I balance. I already know my colors, abc’s and some of my numbers. The Epilepsy Association of Utah (EAU) announces its annual “Get Seizure Smart!” Epilepsy Education Conference, presenting the latest in epilepsy science and treatment options, as well as tools and resources for those affected by epilepsy. The “Seizure Smart” conference will be held Saturday, June 7, 2014 from 8 a.m. to 4 p.m. at Little America Hotel, 500 South Main Street, Salt Lake City. Individuals with epilepsy, families of those affected, medical personnel, educators, and first responders, as well as the general public, are invited to attend. Dr. Ian Miller, pediatric neurologist at Miami Children’s Hospital, international expert in treating Dravet syndrome and member of the Dravet Syndrome Foundation’s Professional Advisory Board, will be the keynote speaker and special guest. He is scheduled to discuss the discovery of genetics in epilepsy and the push for research into CBD-based treatment options. The conference will feature breakout sessions with renowned experts presenting on topics including the complexities of epilepsy, genetics of epilepsy, latest treatment options, alternative therapies, coping and advocacy, managing behaviors and sibling behaviors, mental health, trusts and living wills and patient resources. Several organizations and vendors will be in attendance with tables providing helpful information, a few of which include the Division of Services for People with Disabilities, Hope 4 Children With Epilepsy, Utah Kids, Utah Parent Center, Autism Council of Utah and Brain Balance Centers. With the recent passage of HB105 “Charlee’s Law” allowing for the possession of high-CBD/low-THC cannabis oil for the treatment of intractable epilepsy in adults and children, the EAU will present the specifics of the new Hemp Extract Registration Program and the safe and effective use of the therapy. Jennifer May, co-founder of Hope 4 Children With Epilepsy, the EAU’s parent advocacy group who lobbied in favor of the bill, will be walking patients through the details of the law and the processes required to gain access to approved extracts for treatment. As the leading provider of high-CBD/low-THC cannabis oil, Realm of Caring’s own Heather Jackson will present information about the oil as a treatment for intractable epilepsy. Realm of Caring is a non-profit organization in Colorado who oversees the cultivation of the Charlotte’s Web plant and its processing and distribution as Alepsia, a non-psychoactive extract infused in oil. “Our goal with the Seizure Smart Epilepsy Conference is to provide those affected by epilepsy with the tools needed to educate themselves, as well as those around them, and obtain the best treatments possible, whether they be mainstream or alternative,” said April Sintz, EAU Conference Chairperson and H4CE leadership member. “We want to empower people by giving them choices and resources that are available to all of us here in the state of Utah,” Sintz stated. Cost for the conference is $30 for the public ($15 for EAU members) if registered in advance; an additional $10 charge will apply for those registering at the door. A light breakfast, a catered lunch, and a “loot bag” will be provided for each attendee. Registration is open on the EAU website at http://epilepsyut.org/conference2014.html. Founded in 1973, the Epilepsy Association of Utah is a 501(c)(3) charity dedicated to enhancing the quality of life for all individuals living with epilepsy and seizure disorders. One in 26 people will develop epilepsy at some time in their lives, totaling over 100,000 people in Utah alone. Epilepsy is the fourth most common neurological disorder in the US, after migraine, stroke and Alzheimer’s. 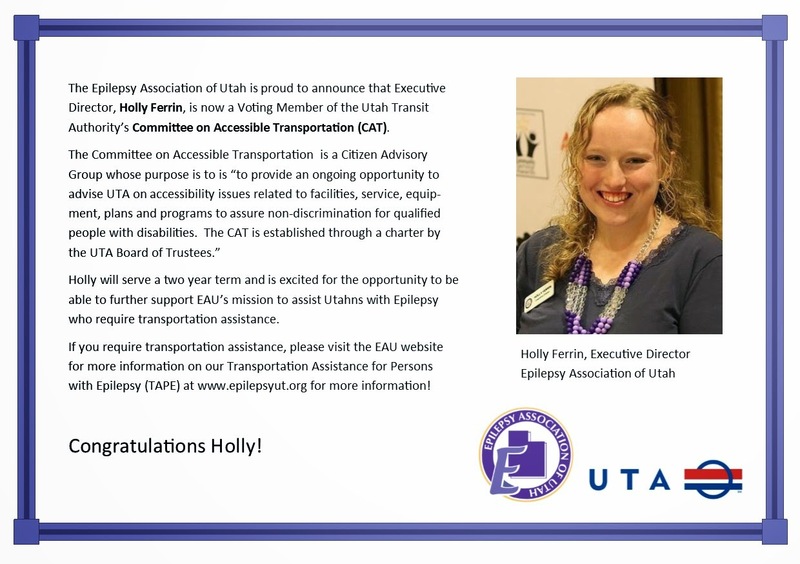 The Epilepsy Association of Utah offers a public education program, statewide support groups, personal and professional advocacy, college scholarships, art exhibits, educational conferences, summer camp and more. Visit http://epilepsyut.org for additional information. My son Austin, who had been a totally normal baby up to this point, had his first seizure at four months old. What appeared at first to be a hyper-moro reflex turned into him having more than 12 episodes of his whole body jerking and his eyes open and staring in 12 hours, lead us to believe he was really having seizures. The following day an EEG was performed and indeed he was having seizures. We began mediation that for the next two months seemed to control his seizures and then the seizure pattern changed and he began having more of a tonic/clonic-generalized seizure. Most of Austin’s seizures happen when he is going to sleep, during sleep and upon waking up in the morning. Because of this he cannot sleep alone or he would try to get to someone and hurt himself, therefore he has to sleep with a member of our family at all times. Since four months of age Austin has never been completely controlled and has been on approximately 10 different medications, including ACTH injections daily at nine months old for 30 days, even with all of these we have not been able to help him be completely seizure free. Many of these medications are given together in hopes of control. Currently, Austin takes three different seizure medications and recently had to weaning off of one due to the side effects that caused a severe tremor in his hands, much like that of a Parkinson’s patient, this tremor was preventing him from performing normal tasks such as feeding himself and getting dressed. Austin has had up to as many as 10-15 seizures in a day and currently is having anywhere from 1-8 per day. His seizures typically last around 30sec. to 3 minutes, causing total body shaking, eyes opening staring or eye fluttering, gurgling noises, and sometimes he tries to climb out of bed. In 2001, Austin had a Vagus Nerve Stimulator (VNS) placed. The purpose of the VNS is to stimulate the brain counteracting the electrical impulses that the brain is giving off causing seizures and hoping to stop the seizure from either happening at all or decreasing the severity of the seizure. For Austin the VNS is on a setting called rapid cycle, which means that it is stimulating his brain for 25 seconds than off for 5 seconds than on again continually. The VNS also has the capability to increase the amplitude of the stimulation and stay on for one full minute if a seizure is seen by family, we do this by swiping across his chest with a high powered magnet where the VNS is located. Because, the VNS is ran by a battery it only lasts about 4-5 years requiring a replacement of the battery pack. So far, Austin has had three surgeries just for his VNS since it was placed in 2001. Austin started showing development delays around the age of two and has continued to have delays throughout his life. He has speech, fine motor, and academic delays; he has been classified as Intellectually Disabled. He is 20 years old and academically functions at about a 4-5 year old and socially about a 12-14 year old. He also has a diagnosis of ADHD and Anxiety, both requiring medications. He also needs medications to help him sleep at night. Even through all of this Austin is a fun, loving, energetic young man that is loved by all! His favorite thing to do is play his Xbox and he can play just about any game you give him. Austin also participates in special needs sports league and love to play baseball, basketball and soccer. He has lots of friends and it seems like anytime we are out he finds someone he knows. We are so proud of all the accomplishments he has had in his life and look forward to many more! First time hearing about Camp Neuro Revolution? Learn more about us by visiting our facebook page.